Personal gas safety monitors can be found in almost every industry, with the requirement for multiple gas detection becoming commonplace. Most of these gas detectors measure both Carbon Monoxide and Hydrogen Sulfide. Alphasense new 2sense H2S+CO gas sensor allows designers to reduce significantly their gas detector size and cost. The patented 2sense uses a new approach to dual gas sensor design. A larger version of the D2 sensor, which has a proven track record in the field over many years, the 2sense does not compromise performance or long term stability over the standard two-sensor solution when measuring both H2S and CO.
Save space and save cost with our 2Sense family of dual gas sensors, in the A-series 20mm size. With a patented design and best response, these dual sensors offer the required performance with obvious advantages. 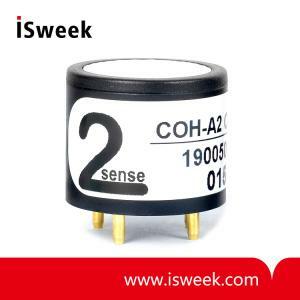 CO / H2S the COH-A2 builds on 10 years of experience with our original D2 sensor.